Get a taste of the innovative creations we have in store for you at our unique dining locations - Lowe Dining Hall, the Griffin's Cove and our newest quick serve options at the Arts Center and in the JoAnne Woodyard Boyle Health Sciences Center. Some of the food you will enjoy in our dining halls is grown right here on campus in our Green Thread Garden. Find out more information on meal plans or about Dining & Food Service at the Campus Dish site. 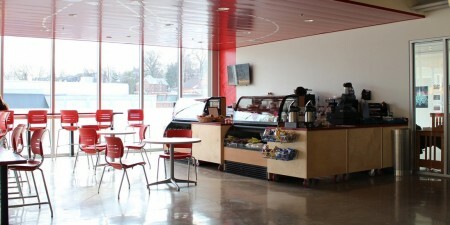 The setup of the Vibe Fresh Market allows for a self-serve grab and go option for students. 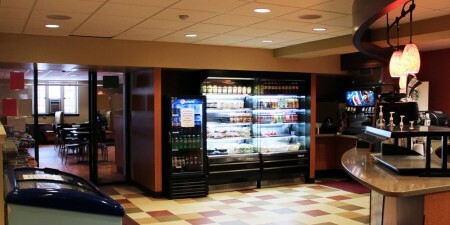 The Market and small eat-in area, are centrally located in the hub of the JoAnne Woodyard Boyle Health Sciences Center for easy access for all students.